The #1 Cloud Integration Platform as a Service (iPaas). Typical integrations require complexity of developers deciphering complex APIs, developing web services and/or implement a service architecture (SOA). Tricension utilizes Dell Boomi to greatly simplify this complex and costly process. It provides one, simple-to-use visual interface for creating integrations, which allow the sharing of data between multiple systems including cloud-based, SaaS and on-premise. It supports real-time integration, Master Data Management (MDM) and elastically scales to meet high-volume needs. If you need to connect two applications like NetSuite to Salesforce or Salesforce to Microsoft GP we have you covered with Dell Boomi! Dell Boomi’s Multi-Tenant architecture means you don’t have to worry about hardware breaking or software upgrades for your integration needs. By utilizing a cloud environment your headaches are reduced and your costs are predictable and manageable with a monthly fee. Boomi provides a visual design interface to make the complex easy, while including strong core integration capabilities of an enterprise-class solution. Typical integrations require complexity of developers deciphering complex APIS, developing web services and/or implementing a service architecture (SOA). Dell Boomi greatly simplifies this complex and costly process by providing one, simple-to-use visual interface for creating integrations. After a quick signup and provisioning, you can begin creating integration processes immediately. With a library of pre-built connectors and processes along with familiar drag-drop tools you can build integrations with exceptional speed from basic to highly sophisticated integrations. A business analyst is now able to accomplish what previously required a development team. With Boomi AtomSphere you receive high-end integration capabilities including content-based routing, process flow control, exception handling and messaging that take your integration well beyond basic data mapping. Much like Predictive Typing with Google helps you find the information you want with speed, predictive integration algorithms help you build integrations with greater speed and accuracy. With the ability to use pre-built connectors and AtomSphere’s predictive learning algorithms built on other users integration needs you are able to leverage an entire community, reducing costs and errors and ultimately providing a reduced time-to-value. You will achieve unprecedented speed of implementation with Boomi AtomSphere, which aren’t possible with traditional integration package, custom coding or hardware applications. 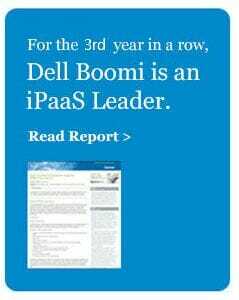 Dell Boomi was the first to introduce an Integration Platform as a Service (iPaas) in 2008. Since Dell Boomi has been delivering iPaaS as a cloud-based service for application, data, process and service-oriented architecture (SOA) integration needs. It is a multi-tenant platform supporting cloud-to-cloud, cloud-to-on-premises, on-premises-to-on-promises and B2B integration. HOW CAN IPAAS BENEFIT YOUR ORGANIZATION? As organizations seek to take advantage of the speed, agility and economics of the cloud, there’s an increasingly critical need to look at integration in a new way. iPaaS is purpose-built to help companies handle the integration requirements of today’s business environment, future-proof their integration solutions and increase the value of their IT investments. iPaaS customers realize significant, concrete, cost and speed-of-implementation benefits. We invite you to consider how iPaaS can help you derive greater return on investment, faster time-to-value and increased business success. Please provide your details below so we can send you additional information on Dell Boomi and learn more about your integration needs.